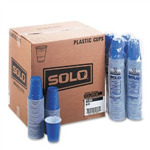 If your customers are shopping for a party, these Blue Solo Cups are a crucial addition to your product range. They are a cool alternative to our popular Red Solo Cups, and they are sturdy enough to be used all night long. Solo is the leading brand of plastic party cups, and these cups have been seen in all manner of American teen movies and TV shows. The cups are ideal for party stores and suppliers of drinking accessories.